As the launch of Windows 7 approaches, Microsoft is distributing literature to American retailers claiming that Linux works with few peripherals or online services, offers limited software capability, affords no authorized support, does not work with games "your customers want," and cannot use video chat on any of the major IM networks. 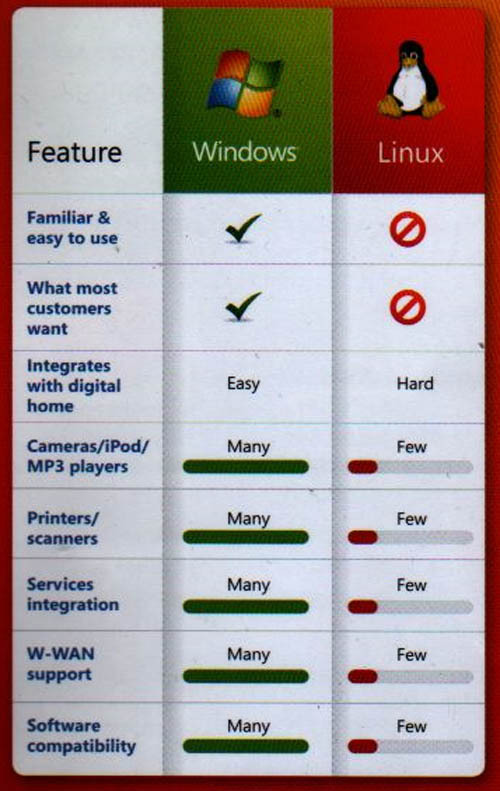 "What most customers want" is Windows, the literature says, not Linux. According to a sales employee working in an Office Depot store on the east coast of the United States, a Microsoft representative recently provided him and his fellow sales staff with booklets that attempt to put Linux in an unfavorable light. And the booklets mirror information from a Microsoft online training course given to Best Buy employees, just brought to light by the Advanced Linux Technology blog. The claims are not unlike those Microsoft has made in the past, and Redmond has acknowledged the materials are authentic. "Microsoft works with its partners to help them prepare to sell our products in a competitive marketplace," a company spokeswoman told The Reg, before referring to the Best Buy slides. "This deck, which is just one of many reference materials we provide our retail partners, was specifically developed to show sales professionals the important differences between Linux computers and Windows computers, so they are well equipped to help customers purchase a PC that gives them the experience they expect." On both charts, Microsoft cites Linux.org and the Microsoft Windows Compatibility Center as sources. But many of the claims are misleading at best. As pointed out by the Best Buy employee who took Redmond's online training course, World of Warcraft - Microsoft's example of a game "your customers want" - can run on Linux via WINE, a free software app for getting such Windows apps onto the open-source OS. Countless outfits provide Linux support. Video chat is available from Skype and other services. And using an iPod on Linux is far from unheard of.